-Gold Nugget appears grouped on reels 2 and 4 during normal games and substitutes for all other symbols except scattered "PayDirt" Signs. 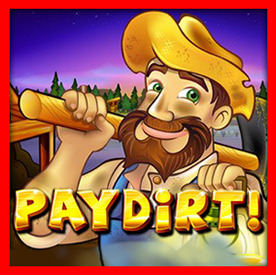 PayDirt prize is triple when one or more Gold Nugget substitute in a winning combination. -PayDirt Scatter win are multiplied by total bet. -Wins on different lines are added. Paydirt scatter wins are added to line wins. -Line wins in PayDirt are multiplied by bet per line. -Maximum win per paid spin is 50,000 times per line. -All symbols pay left to right except scattered "PayDirt" Signs, which pay Any. -3 or more scattered "Paydirt" Signs triggers a pick feature. -Select a "Paydirt" sIGN TO REVEAL 1 OF 3 Features. -All feature free game are played at the lines and bet of the triggering game. -12 Free Games are awarded, during which grouped Gold Nuggets can appear on any reel. Any 3 or more " PayDirt" Signs appearing during these free games will add 12 free games. -5 Free Games are awarded, during which reel 3 is made up entirely of Gold Nuggets. Any 3 or more " PayDirt " Signs appearing during these free games will add 5 free games. "PayDirt" signs triggers a pick feature, select a " PayDirt " Sign to reveal 1 of 3 Features. All feature Free Game are played at the lines and bet of the Triggering Game. -5 Gold Mines are revealed. Select a Gold Mine to reveal a Bonus Symbol. Additional picks may be awarded, with each selected mine revealing an extra Bonus Symbol. 10 free games are then played, during which any Bonus Symbol appearing will be replaced with a Gold Nugget, before pays are awarded. Any retrigger will add 10 free games to the current free games series.